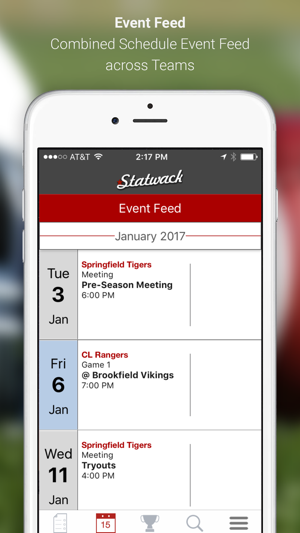 Statwack is the best team management app available. Use it for any team or club. "Finally! 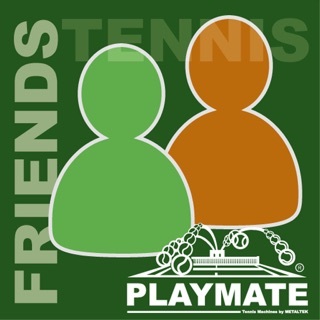 An app that saves me time, so I can focus on coaching." -- Coach Tom T.
It is the "go to" app for sports teams, clubs and leagues to organize and track schedules, news, player rosters or membership and web links. - News: Post news articles and everyone following the team will receive a mobile app alert and/or email. You can even attach photos & videos. - Schedule: Easy to read list of events with dates, times and other details along with results and scores for past events. 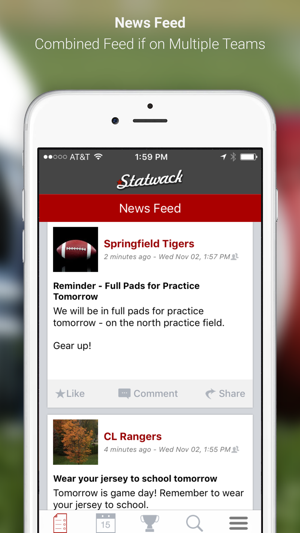 - News Feed & Event Feed: Statwack's signature feature. A combined chronological list of News and Events for all the teams you are following. Great for users who are involved with more than one team or club. - Results: Easy to enter results after the game that also sends out notifications with an automatically created scoreboard image. - Stats / Roster: Grid of stats. Perfect for a roster of names, positions and any stats or other information you would like. - Web Links: List of links that open inside the mobile app. Useful for registration forms, waivers and other information already on the web. - Fan Club: Attract a fan base to build interest amongst your future players and keep alumni involved. - Admins: Delegate admin access to your team managers and parent liaisons, so you can focus on coaching. - Social Sharing: One tap sharing for News and Photos to Facebook, Twitter, email, text messages, etc. It is the best way for team members, staff and fans to keep track of your team or club's happenings. 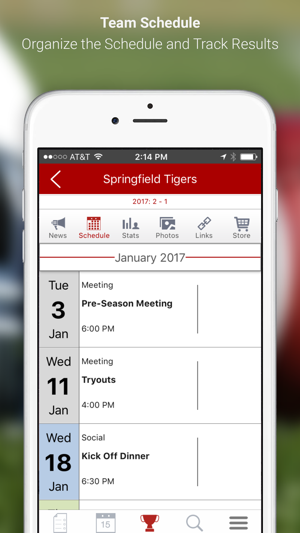 From the football team to the chess club, anything you want to organize and track. 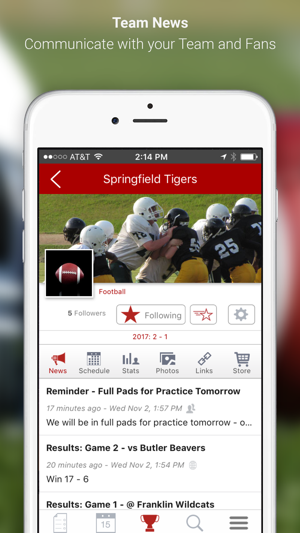 Easy to use app to keep up to date on athletic events. Love the real time text option, but most of all the support by the developer. I was having an issue seeing events do I emailed support. Received an email back very quickly and another when the problem was diagnosed. Then a third email indicating an update was ready. Very responsive. Helpful for getting to know when practice or a game is.